As a global phenomenon, Angry Birds is already huge, but it just got bigger. Like, literally. Samsung Smart TVs can now download the game, making them the first sets to run it without the need of a separate box or device. 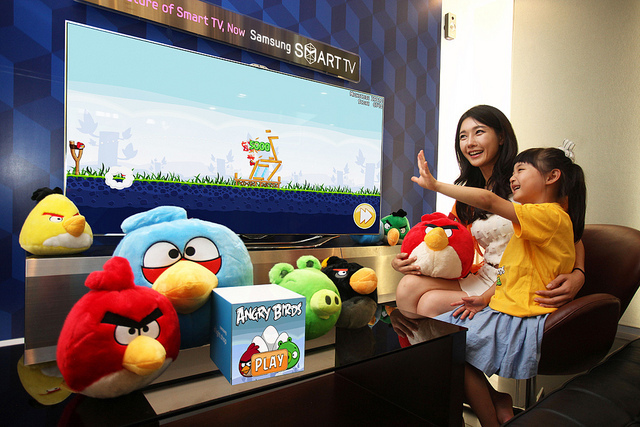 The South Korean TV maker revealed earlier in July that it was bringing Angry Birds to its Smart TV platform, which now supports gesture controls and voice interaction. The company’s 2012 LED 7500 and up and Plasma 8000 models are eligible for the game. Confirmation came by way of Samsung Brazil, which hinted on its Twitter account that these irate ornithoids have indeed gotten Smart on us. “Hello, TV. Farewell, evil pigs,” the message read. The game is a free download from the Samsung Apps store on eligible Smart TVs.